The idea of checks and balances is a foundational building block of the American democracy, but the complexities of this system go beyond the three branches. While the Founding Fathers did not dictate a two-party system, the ability for multiple parties to be viable on the federal level is minimal at best. 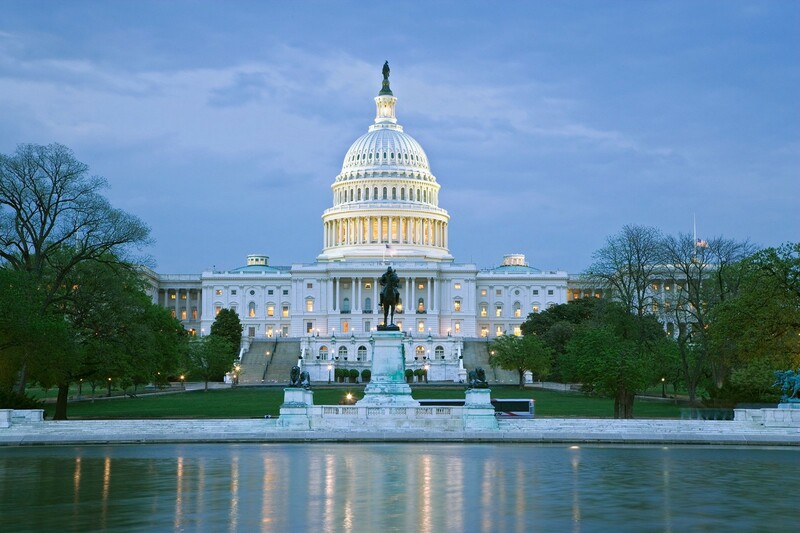 Given our system, and the current political environment, an executive and legislative branch under a single party control is a tough situation to say the least for the minority party. One might think that divided government is preferred based on the number of people moving away from identifying as a member of the two main parties. However, the American public is surprisingly indifferent on which is better for the country. Indeed, in a Gallop Survey last year, a quarter of Americans think it’s best for the country to have a divided government, 37% think it makes no difference, and 33% think it is better to have one party control. Not surprisingly, Republicans are more in favor of one party control when they have it, as are Democrats. President Trump, a non-traditional Republican, in control of the executive branch introduces further complexity into this equation. President Trump’s policy ideas and the way by which he traverses the political process of the House is unique to say the least. And, unified control for the Republicans has not meant total success on implementing Republican priorities (i.e. Repeal of the ACA/Obamacare) although it has meant enough success to get legislation like the tax cuts passed. 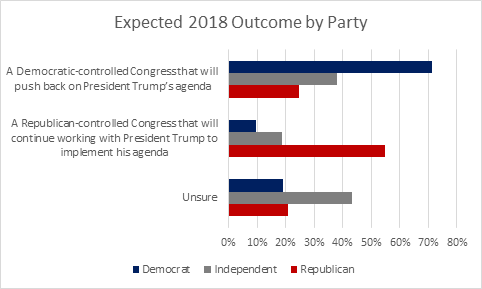 With less than six months to go before the election, the big question is going to be: do Americans want a legislative balance to Trump’s policy agenda or do they want a party-aligned legislative and executive branch to continue? Recently, there has been discussion about Democrats losing their advantage on the generic ballot in national surveys. The White House has been talking about Trump’s year high favorable rating as if no President has ever had a favorability above 40% before. But is this noise or do Democrats have something to be worried about? In our latest national survey of 1,000 American adults, we took a look at how voters are feeling about the upcoming elections and their preferred outcomes. According to our latest national survey, more people prefer a Democratic-controlled Congress than a Republican-controlled Congress. Indeed, when asked their preferred outcome, 45% point to a Democratic-controlled Congress to push back on Trump’s agenda while 37% want a Republican-controlled Congress to continue working with President Trump to implement his agenda. Just 18% of Americans are unsure. While the 45% is not an overwhelming advantage for Democrats they do enjoy a 15-point advantage when it comes to their respective base voters. 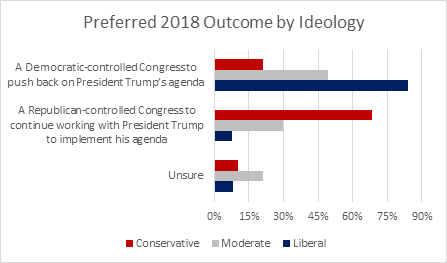 As the chart below shows, 84% of Liberal Americans want a Democratic-controlled Congress to push back on Trump’s agenda, while only 69% of Conservatives want a Republican-controlled Congress to continue working with President Trump to implement his agenda. In further good news for Democrats, almost half (49%) of Moderate voters would prefer a Democratic controlled Congress while just 30 percent point to GOP control as their preference. In comparison to what Americans prefer to have happen, they have varying expectations of the outcome of the 2018 Elections. 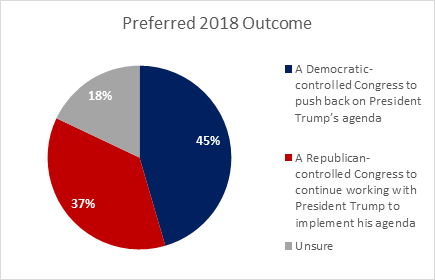 In our survey, we also asked Americans who they think will be in control after the November elections. Overall, voters are more unsure about the expected outcome than they are about their preferred outcome. 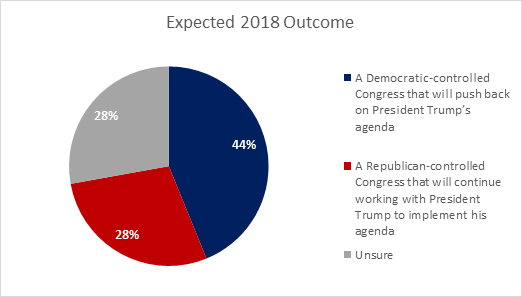 A plurality (44%) expect a Democratic-controlled Congress to be the outcome, while 28% expect a Republican-controlled Congress for Trump’s next two years in office. An equal number are unsure of what the most likely outcome will be. Looking at the breakdown by party, Democrats are more optimistic about their own party’s prospects, compared to the Republican outlook. As of late April, 71% of Democrats and 25% of Republicans expect a Democratic-controlled Congress to be the outcome this November, while 55% of Republicans and 10% of Democrats expect that we will elect a Republican-controlled Congress. Voters who want Democrats to win control are also slightly more confident in their wishes. Of the voters who want Democrats to take charge, 77% think it is the most likely outcome, while 8% think Republicans will maintain their majority status, and 15% are unsure of what will happen. Among those who want the GOP to maintain their control, 65% think it is going to happen, while 16% think Democrats will take over. Not surprisingly, those that are unsure about who they want to be in control are more often than not unsure of what the outcome will be this November. Seventy-nine (79) percent of unsure voters are also unsure of the outcome, while 16% think that Democrats will gain control and 5% believe Republicans will maintain their majority status. Six months can be a lifetime in politics (these days it can feel like two lifetimes worth) and there is still plenty of time for voter attitudes to change. Right now, however, each measurement shows an advantage to the Democratic candidates in both opinions that are held, and a belief in what the outcomes will be. What we are not seeing in the numbers so far is anything pointing to a big Blue Wave. As we have discussed in the past, the House is certainly in play, and control of the chamber will more likely than not be slim. We won’t try to guess how the Founding Fathers would feel about this, but a closely divided house, in either direction, will certainly make things more interesting than they already are…if you can believe it.